Add2Run is a small utility that will allow you to open any file or application from the Start Menu's Run Command dialog box (WIN+R). It has a very simple interface which will allow you to select a file and assign it an alias or friendly name. 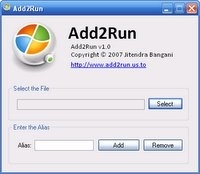 Once added, this alias can be used to open the specified file or program from the Run Command dialog box.